Died at the Médipôle Hospital at Dumbéa, near Nouméa 9 March 2018. Aged 93, Father Jean Hénaff was the oldest of the Archdiocese’s priests and of the Marists in Oceania. He was the second of three siblings; his older sister died at the age of 16, his dear little sister at 14. At the age of 11, a meeting with Father Hervé Narvor, a Marist Father destined for the Oceania Missions, gave birth to Jean’s missionary vocation. His secondary studies, begun at the Apostolic School of Saint-Brieuc, were interrupted by the War. He enlisted voluntarily, serving in Alsace and then in Germany in the region of Baden Baden. After his Marist Novitiate and profession, he entered the seminary in Lyons; his favorite subject was Scripture. Ordained on 28 June 1953 by a Bishop from Benin, he had hoped to leave immediately for Oceania as was his long held desire, but he was sent to a college in the Parisian suburbs to take charge of the intermediate classes. This experience was "two months of purgatory". Education was obviously not his vocation! His superiors quickly authorised his attendance at medical courses for future missionaries and to complete some training in a hospital in Lyons to prepare for departure to the missions. He would regret later not having also learned the building trades! Appointed to Wallis and Futuna, he embarked in November 1954 for Noumea aboard the "Calédonien", with two other alumni of Saint-Brieuc, destined for New Caledonia, Fathers Mingam and Kerdraon. Jean finally arrived in Wallis on 25 January 1955. The boat that had brought him was an old steamer, fired by charcoal, loaded with dynamite and some passengers including three young Wallisian Sisters who had just done a course in New Caledonia. Guess where Bishop Poncet appointed him? The boarding school of Malaetoli! He was Director, and with little funds, had the responsibility for construction of a permanently-built school to replace the old traditionally built classrooms. The school then had about fifty students aged 10 to 14; they were fearless young student-farmers, bare-footed and bare-chested, very different from the pupils of Bury! For him, these eight years spent in Malaetoli, though happy and laborious years, under the burning tropical sun, were at the origin of his skin cancer, which would appear much later. In 1956, the arrival of a carpenter by profession, Br. Clement Bonhommeau sm, released him from some of the construction tasks, and he was able to focus more on the spiritual. When a Council to the Government was set up in 1961, he was appointed as a representative of the Mission. In 1963, he was appointed parish priest of Mata-Utu cathedral; he stayed there 6 years. Believing that the Diocese could easily name another there, he asked to be moved elsewhere. 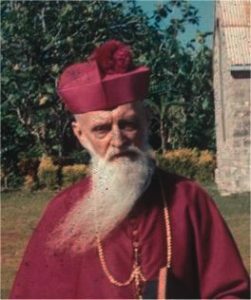 In 1969, after attending a Provincial Chapter in Sydney as Regional Superior of Wallis and Futuna, he returned to a new appointment in New Caledonia. He brought with him a good knowledge of the Wallisian language, which did him great service because many Wallisians and Futunians left their islands, attracted by the nickel boom. Given temporary charge of the parish of the Good Shepherd for a year, he stayed for 25! 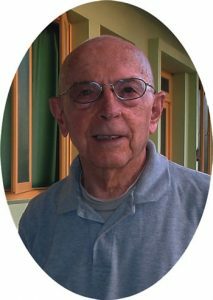 He was noted for his personal involvement in children’s catechism, through his efforts to maintain unity in a disparate and growing parish (several chapels were built in his time in new neighborhoods), and by his willingness to entrust the laity with responsibilities in the wake of the Second Vatican Council. He also supported the development of a singing group, encompassing human and social training of young girls, called the "Living Stones", launched in 1991 by Monique Legenne; and that of Marist Fraternities, open to all ethnic groups, launched in the parish by Sébastien Leleivai in 1993. In 1995, appointed Regional Superior of the Marist Fathers, he moved to the Marist House in the rue Baumier, Val-Plaisance. He served only one three-year term, but he stayed ... 21 years (had not he made the vow of stability? ), looking after guests (whom he treated with his homemade Breton cakes), running the Marist Fraternities, and providing to those parishes which requested it, catechetical formation (he was part of CERN - Religious Education Center of Noumea) or mass supply, notably at Païta. In 1993, he participated in a General Chapter of the Society of Mary in Rome, as delegate of the Province of Oceania; it was his last trip to Europe. For three years, in his Citroen Berlingo, he crisscrossed the territory to prepare the parishes and tribes who had called him, for the Great Jubilee of the year 2000: 73 in all. Late in life he acquired a computer, which allowed him, in his "hermitage", to remain connected to the rest of the world. All his life he took advantage of every opportunity to announce the Good News, even if only by saying to shop assistants or people he met in the street, "May God watch over you." At the end of 2016, no longer able to remain alone, he resigned himself to retiring to the Little Sisters of the Poor at Ma Maison. Hospitalised at the Médipôle of Dumbéa, he died peacefully on Friday 9 March, after receiving for one last time the Sacrament of the Anointing of the Sick. May his works accompany him, and may he rest in peace. "Alula, Patele". "Kenavo" (goodbye, in Breton). "May God watch over you". And that the Virgin Mary who had called you in her Society and whom from your youngest age as a Breton you called upon under the name of Our Lady of Kerdévot, welcome you to her Son.